So near and yet so far has long described the gap between Main Street’s underground subway platforms and their open-air counterparts at GO’s Danforth station. Some asked what on earth planners were thinking when GO Transit and the TTC station were being designed (simultaneously, no less). All asked if a tunneled link could remedy this exhibit of intergovernmental dysfunction. The issue’s timely: Provincial transit agency Metrolinx, which intends to increase GO train frequency, has designated the 800-metre radius around Main and Danforth a “Gateway Hub,” where all transit modes – including eight TTC surface routes – are to be linked seamlessly. City planning’s ongoing Danforth Avenues study lists connecting the two stations among its priorities and local politicians have for decades expressed interest in the idea (enclosed bridge as well as a tunnel). 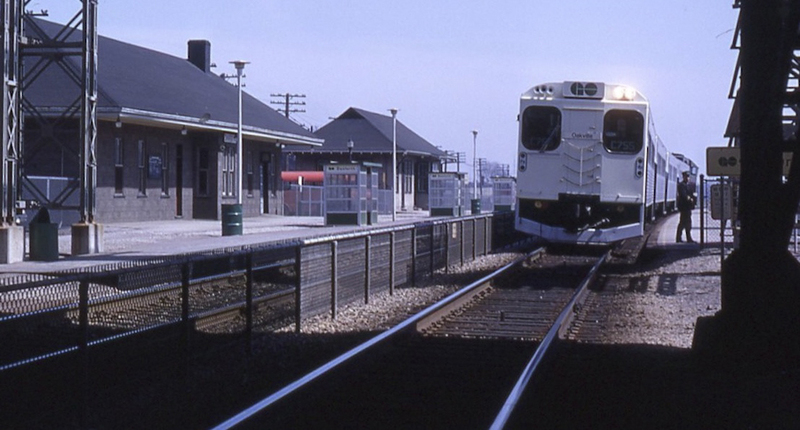 May 23 will mark 50 years since the province launched GO, with Danforth station service. May 11 next year will be the golden anniversary of the TTC’s Woodbine-to-Warden subway extension – with tunnels and Main station on the wrong side of Danforth. What were they thinking? Tough to know for sure, but the TTC had to fully fund itself from the fare-box until the 1970s and likely feared GO muscling in on its market. Richard Soberman, dean-emeritus of local transit planners, says some at the ministry even argued that Union should be the only GO stop in what we call 416. Oh, and did we mention Ottawa added to the chaos? Just 41 days after the subway opened, CMHC, as part of a federal affordable-housing plan, got city hall’s nod to build 2,000 units with ground-level retail on 7.5 acres of CNR land at the southeast corner of Main and Danforth. (CNR was then a Crown corporation, meaning the public owned the land separating the two stations, but expropriated properties to build TTC’s). No incriminating documents have been found, but CMHC’s four towers – Main Square – sure appear to have been deliberately aligned to ensure GO and TTC could never build a direct connection. My dad clued in early, and I mentioned the impending gap in a May 1967 “current events” presentation about GO’s launch for Mr. Rowe’s Grade 5 class at Balmy Beach. The first public expert acknowledgement of a problem appears to have come after both transit services were operating (a potential connection is mentioned in a regional proposal within the TTC’s 1969 annual report). So, 50 years on, can a tunnel provide enough benefits to East Enders and/or commuters passing through to justify costs? After talking with nine transit experts, it’s clear to me the numbers don’t add up – even if a link looks logical on a map. And that’s without factoring in that TTC ridership at Main is down 14 per cent since 1987 and that GO Danforth, despite a 50 per cent ridership increase, still sees less than half the volume of the least used bus route into Main Station. A connection would be costly and likely no more successful than the recent experiment offering Metropass users an option to pay an extra $60 monthly to ride GO from Danforth to Union. To work, the enticement to switch trains at Main-Danforth would have to be far more than mere weather protection for the walk (five to seven minutes for me, depending on the traffic light and whether the eastbound GO platform is a Point A or B). Even if GO offered subway-like train frequency and accepted TTC fares and transfers (highly unlikely under current regimes), most downtown-bound a.m. subway commuters from the east would make the shorter switch at Kennedy, if they switched at all. A July 2016 TTC report indicates a connection would be more than twice as long as that bleak 140-metre tunnel joining parts of Spadina station. If a link’s only purpose is to channel people between stations, it’ll often be dead and potentially dangerous. How about something like the PATH under our downtown office towers, an idea raised by Nathan McLachlan, property management director for Talisker Corp. (which bought Main Square from CMHC in 1998)? It’s an intriguing idea, but it too would be dead (likely with lots of vacant shops) unless Main Square can suddenly attract lots of people for different reasons at different times of the day; we’re talking intensive additional uses, not just building the two residential towers Talisker got approval for last decade. The area has density – 17,000 combined residents and jobs, 70 per cent above a Gateway Hub’s base goal. But it’s overwhelmingly residential, lacking a healthy urban usage mix. An indicator that something’s askew and unusual is that house prices drop the nearer one gets to Main station, according to a report by N. Barry Lyon real estate consultants. The area has evolved in such a way that the local economy is far more of an issue than an unfortunate gap in transportation connectivity. It needs to become a live-work-play-study economic hub, a potential focus for the design competition idea mentioned in the previous column. So near and yet so far? Sure, and it will be for a while. But if we toss the hoary assumptions, demand more than simplistic solutions and get all three levels of government co-ordinating efforts with private landholders, there’s hope. Wickens, you talked about this issue when you did a Grade 5 class presentation?! You are clearly a special kind of transit nerd! Rob: You have to put yourself in the mind of boy growing up in Toronto in 1967. I’d been alive 10 years in which the Maple Leafs had won four Stanley Cups and we seemed to be continually building good subways, quickly, on time and on budget (without funding from Queen’s Park and Ottawa). Add in the Beatles and I had three hugely exciting reasons to be reading more than one newspaper a day. Things change. Another great article Steve. And some great ideas (including PATH). So is the property still owned by CMHC or Talisker? Thx, Gerry. Talisker bought it from CMHC in the 1990s. This does seem obvious; but I’m not so aware of all the history, and yes, possible machinations. But what about getting all the buses to first go to the Danforth Stn, and then back up? There’s space to the side of bridge, and tunnel under it, though the return trip/path back up to the road of Main is less easy/obvious. But if we think that the money is obviously around – if we can do a Suspect Subway Extension then why not something logical/planned? – then we can unfetter imaginations.